LOS ANGELES, Calif. - The U.S. Postal Service today honored film and TV star Lucille Ball with the issuance of the 34-cent Lucille Ball commemorative postage stamp. The Lucille Ball stamp first day of issue ceremony took place this afternoon, the date of her birth, at the Hollywood History Museum, located in the historic Max Factor Building in Hollywood. "It's a pleasure to be here today as we continue our celebration of Hollywood legends with a stamp that honors America's Queen of Comedy, Lucille Ball," said Alan C. Kessler, a member of the presidentially appointed Postal Service Board of Governors, who dedicated the stamp. "'Lucy,' as she was fondly called by millions of adoring fans, was one of America's most admired, beloved and talented actresses of the 20th century. Now she joins other Hollywood notablesincluding Humphrey Bogart, Alfred Hitchcock and Marilyn Monroewho have also been featured on U.S. postage stamps in recognition of their contributions to the entertainment industry," said Kessler. Joining Kessler was Johnny Grant, chairman of the Walk of Fame and the honorary mayor of Hollywood, who presided over the ceremony. Other participants were Fred Ball, brother of Lucille Ball; Donelle Dadigan, founder and president, Hollywood History Museum; Jean Picker Firstenberg, director and CEO, American Film Institute; and actress Virginia Mayo. The Lucille Ball stamp is the latest in the Legends of Hollywood series, which has also honored Marilyn Monroe (1995), James Dean (1996), Humphrey Bogart (1997), Alfred Hitchcock (1998), James Cagney (1999) and Edward G. Robinson (2000). Ball was born Aug. 6, 1911, in Jamestown, N.Y. She appeared regularly on American television for nearly three decades. Ball endeared herself to viewers in her role as Lucy Ricardo on I Love Lucy, which debuted in 1951 and ran until 1957. The enormously popular show, which teamed Ball with her real-life husband Desi Arnaz, chronicled the unlikely adventures of a wacky, redheaded housewife and her husband, Ricky, a Cuban bandleader. The episode that first aired on Jan. 19, 1953, in which Lucy Ricardo gave birth to "Little Ricky," was watched by more people than any other television show of its time. I Love Lucy is still enjoyed today and has been seen in more than 80 countries around the world. Ball's other television series included The Lucy-Desi Comedy Hour (1957-1960), The Lucy Show (1962-1968), Here's Lucy (1968-1974) and Life with Lucy (1986), in which she played a feisty grandmother. Lucille Ball also appeared in more than 70 movies, including Stage Door (1937) and Too Many Girls (1940). While filming Too Many Girls, Lucy met Desi Arnaz, who was also starring in the film. They were married on Nov. 30, 1940, and subsequently appeared together in the films The Long, Long Trailer (1954) and Forever Darling (1956). Throughout her film career, Ball's other leading men included Bob Hope and Henry Fonda. Ball's versatility was evident in many of her other performances as well. She starred with Richard Denning in the CBS radio comedy My Favorite Husband, a forerunner to I Love Lucy, from 1948 to 1951, and she also appeared on the Broadway stage in the 1960 musical Wildcat. She was also a businesswoman. In 1962, when Desi Arnaz retired as president of Desilu Studios, Ball purchased his entire holdings and became the first woman president of a major Hollywood production company. She later sold it and formed her own company, Lucille Ball Productions. In addition to receiving four Emmy Awards, Ball received numerous other honors. She was one of the first inductees into the Academy of Television Arts and Sciences Hall of Fame in 1984 and received the Kennedy Center Honors in 1986. Shortly after her death on April 26, 1989, she was posthumously awarded the Presidential Medal of Freedom. 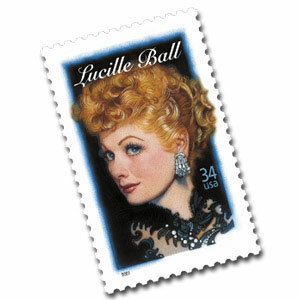 Lucille Ball has previously appeared on U.S. postage. On May 26, 1999, in Springfield, Mass., an I Love Lucy stamp, featuring a black-and-white photograph of Lucille Ball and Desi Arnaz, was issued as part of the Celebrate The Century stamp series. It was among the public's 15 selections for stamps commemorating the 1950s. The stamp art by Struzan, of Pasadena, Calif., is based on a circa 1955 black-and-white photograph. Derry Noyes of Washington, D.C., was designer and art director for the stamp. On Aug. 7, 110 million Lucille Ball self-adhesive 34-cent stamps will be available at post offices nationwide.